When Lien Chan took off from Taipei on Tuesday morning, it was drizzling; but he was embraced with sunshine when he landed in Nanjing in the afternoon. The change of weather dawned on at least one member of Lien's 70-strong delegation. Joanna Lei, who is accompanying Lien on his ground-breaking journey, said the weather change is symbolic, and she sensed history in the making: "It would have taken just two and half hours from Taipei to Nanjing by direct flight, but we took 50-60 years." Lien, KMT chairman, was very emotional when he made his speech in Nanjing, China's capital when it was under KMT rule. "I really missed you all," he said, moving several in the audience to tears. Nanjing is very different from what he remembered when his mother took him on a boat trip from Chongqing, he said. But his mother-in-law was a Nanjing native and his wife considered herself a Nanjinger before she got married. Lien Chan was born in Xi'an, Northwest China's Shaanxi Province. 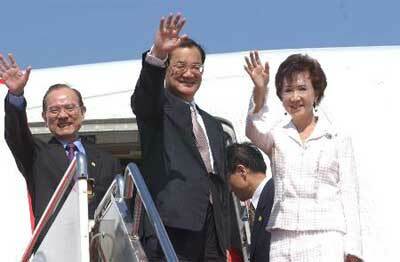 Both Nanjing and Xi'an are on Lien's itinerary for the first trip after a 60-year absence. 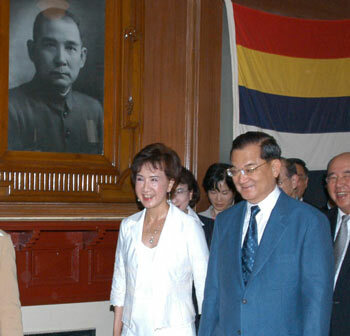 He and his Kuomintang are calling the expedition "the journey of peace." And his goodwill is being reciprocated with an outpouring of hospitality, though tinged with a certain degree of curiosity. In Nanjing yesterday, the Sun Yatsen Mausoleum opened its central gates for him. The local Zhuangyuanlou Hotel prepared delicacies like tea-leave eggs and osmanthus lotus. In Xi'an, he will be treated to a banquet in the Tang Dynasty style. A dance drama from the same era will be performed. For the tour of his Xi'an alma mater, 100 students have rehearsed a special programme for this very different yet similar alum. China Eastern Airlines, flying his delegation from Hong Kong to Nanjing, prepared special Shaanxi cuisine and had a flight attendant aboard who speaks the local dialect. But there is no need because Lien left Xi'an barely a teenager and can no longer speak the Shaanxi dialect. Zhao Rumei, Lien's cousin still living in Xi'an, used to play with him when the two were small children. She said she could still recognize him when she spotted him on television. Many residents in Ducheng Village in Xi'an's Chang'an District were glued to the tube. They were excited that one of their fellow villagers - and such a prominent person at that - was coming back for a visit. A few senior citizens reminisced about what they remember of Lien as a child. "He was naughty, just like the other children," said Sun Shaoxin, who is eight years older than Lien. "I wish he could find time to drop in for a chat, just for old time's sake." The Lien family originally hailed from Fujian Province and later moved to Taiwan. Lien Chan's grandfather is renowned for penning "The History of Taiwan." He moved to the mainland in 1911 and took the family back to Taiwan in 1946. Ordinary netizens overwhelmingly support Lien's trip. As of Tuesday, more than 3,000 people left words of welcome on People's Daily's website. "It's nice that Mr Lien has come back for a visit. I hope he will take back the sentiments of mainland compatriots. We're all one family and should unite for a brighter tomorrow," wrote one. A survey undertaken by the Social Survey Institute of China, which questioned 1,000 people in several major mainland cities, revealed that 69 per cent believe that Lien's trip will "take cross-Straits relations out of the winter and into the spring," while 71 per cent said the "trip will broaden the road for dialogue." Meanwhile, Lien's delegation is being mobbed by a 500-strong press gaggle wherever he goes, including 100 from Taiwan and 200 from the mainland. For the sake of security, they cannot "get up close and personal" because there is a three-metre off-limits zone.